Cultra Railway Station is on the express track back to life after significant renovations were unveiled for the first time last week. It is 'fantastic' to see the much-loved location restored to its former glory. 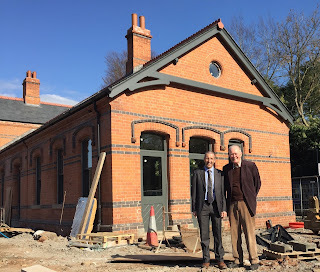 Since 2011, my colleague, former Councillor and now Chair of Holywood Conservation Group Larry Thompson, and I have worked hard to ensure rapidly deteriorating Cultra Station House didn't hit the buffers and was instead on the fast track to a full revival after being seized by NAMA. Far too often we see historic buildings fall into a state of disrepair, but rather than let that happen to Cultra Station House, Alliance has consistently fought to see the arrival of a functioning site. That's now fully ready and promoting a positive sense of community spirit after many local people and organisations boarded the campaign, from Holywood Conservation Group to Ulster Architectural Heritage Society, a previous Environment Minister and even a Irish TD. This is a success story. Cultra Station House has overcome health and safety concerns, the economic crash of 2011 and many other disappointments, to offer local people a truly wonderful place to live. I'm very proud to have been involved in this project from the start and would encourage everyone to look at what has been achieved.